(a.k.a. Visual Workplace, Visual Factory) A workplace organization tool/process that maximizes the cleanliness, organization, and safety of all elements in a working environment. Sort: Remove all unneeded items from the workplace. Set In Order: Make a place for everything and put everything in its’ place. Shine: Thoroughly clean and inspect everything in the work area (preventative cleaning also applies). Standardize: Maintain the improvements through discipline and structure. Sustain: Continue to support 5S efforts through auditing, job descriptions that include maintenance of the system, management support and expectations, etc. Note: 5S efforts almost always improve workplace safety, operator morale, quality, and throughput. It can also be very impressive to visiting customers and prospective clients. Click HERE to see some photos that show great examples of 5S organization principles at their best. (a.k.a. “5 Why’s & 1 How”) A pen and paper tool for discovering the root cause of a problem or issue. (1st Why) Why is there oil on the floor? (Answer after investigation) It is leaking from a hose. (Answer after investigation) The hose is rubbing on a fan belt. (Answer after investigation) The fan belt housing is very loose. (Answer after investigation) Some of the bolts that hold it in place are missing or broken off. (1 How) How do we fix the problem? (Answer) Replace the hose and fan belt, remove broken bolts on fan belt housing and replace with new ones, torque all bolts to proper specifications, check bolt torque with regular preventative maintenance. Note: You probably noticed our example only includes 4 whys. The number of whys is much less important than finding and fixing the root cause of the problem you are having. A scientific/data-driven approach for achieving 6 standard deviations between the mean and nearest specifications limit. Six Sigma methods can be applied to all aspects of manufacturing, transactional processes, and virtually any form of work or processing. Comments: In application we have found a Lean Manufacturing approach to correcting serious problems and realizing significant gains followed by using 6 Sigma methods to “fine tune” and realize further gains to be a very effective strategy. Many now use the term “Lean Sigma” to reinforce the cooperative nature and capabilities of each improvement tool. (a.k.a. “7 Deadly Wastes of Manufacturing”, “7 Sins of Manufacturing”, etc.) The 7 wastes are activities identified and categorized as non-value adding events or processes that limit profitability in a company. 1. Overproduction: Making more parts than you can sell. 2. Delay: Waiting for processing, parts sitting in storage, etc. 3. Transporting: Parts/Materials: Moving parts to various storage locations, from process to process, etc. 4. Over-Processing: Doing more “work” to a part than is required. 5. Inventory: Committing money and storage space to parts not sold. 6. Motion: Moving parts more than the minimum needed to complete and ship them. 7. Making Defective Parts: Creating parts that cannot be sold “as is” or that must be reworked etc. Note 1: This is a terrific list and is commonly accepted as all-inclusive. Of course being “Improvers” we add “Innovation” as #8 which includes failing to tap into the human potential and creativity of your workforce. We contend that this is perhaps among the greatest failures and “wastes” in manufacturing today. Note 2: Another waste, “Re-prioritization” (#9 if you will,) has also become more accepted in the Lean community. It is the practice of incurring waste by doing things like changing from one project or run of materials etc. before its “natural” and/or scheduled conclusion. This may cause increased losses due to setups and customer delivery delays etc. This is the commonly known practice of someone in authority declaring a job “HOT” and prioritizing it to the the detriment of other jobs / customer’s needs. A costing system that identifies the various activities performed in a firm and uses multiple cost drivers (non-volume as well as the volume based cost drivers) to assign overhead costs (or indirect costs) to products. ABC Costing considers the impact and relationship of cost drivers with activities performed. Example: Every “widget” you produce was sitting in a building that you are paying for. Therefore every “widget” has cost added to it by virtue of it being in your plant. Consider also the electricity, water, air conditioning, etc. that have an impact on every product you produce. A methodology for determining inventory levels based on value, space consumption, and turns. “C” type inventory is fairly inexpensive (If it consumes little space and costs very little don’t lose any sleep over it. That said, you should keep this inventory to a reasonable minimum as well. Note: There is much more to explain on this topic, but this should get you started when engaging in an inventory reduction process. A “Visual Control” device that indicates the “Status” of a machine, line, or process. Frequently audible alarms or warning messages accompany ANDON status lights as a secondary method of communicating a problem has arisen. Red (A problem has occurred, the machine or line is “DOWN,” and “Urgent attention is needed. Comments: As Lean practitioners we have seen ANDON lights and warning sounds be very effective in certain settings and within a disciplined Lean culture. Conversely, we have seen them very much ignored and therefore disconnected due to their annoying qualities and lack of discipline. ANDON’s can be very effective in highly automated processes to alert support personnel of problems who must attend to several automated processes at a time or are not located in close proximity to the machines they oversee. Stopping a machine automatically or without intervention when a defective part has been created. Comments: Some forms of Autonomation do include human intervention to detect defective parts but the ideal is to have a machine detect a defective part and then correct the problem on its own. Autonomation devices can be very complex involving sensing equipment, lasers, scales, etc. or it can be as simple as parts not being able to pass through a dimensional gauge. This method typically causes a backing-up of the system which at some point triggers a shut-down switch or alarm to gain operator attention to the problem. Likewise, if a plant produces “1 part every 15 seconds” they are overproducing (see 7 wastes), and are not “in balance” with their customers. (a.k.a. “Batch Processing”) Producing lots or quantities of a product in order to achieve maximum “Economic Order Quantities” (EOQ). Comments: Although some products must be batched to maximize use of equipment with long cycle times, often batching is wrongly assumed to be more economical than single piece production for various reasons. Often when large “batches” are the preferred operating mode it is due to excessively long or difficult changeover practices. Improving changeover techniques through SMED implementation will generally minimizes lot or “batch” sizes, reduce finished goods inventory on-hand, allow for increased varieties of products that can be made more quickly, and ultimately lead to greater customer responsiveness. A comparison tool used to determine the level of process, product, or other successes your company is experiencing when compared to similar companies with similar products or processes; typically competitors. Methods include tracking metrics like On-time Delivery, Defective Parts Per Million produced, wages paid, market share growth and projections, etc. Note: Most successful companies use benchmarking to identify strengths and weakness as compared to competitors and make needed adjustments. The slowest operation (choke point) in a manufacturing process. Do not confuse this with a company’s “Constraint” taken from TOC (Theory of Constraints), which is the slowest operation in an entire manufacturing system that, if remedied, would increase overall company throughput. Example: In a work cell containing 5 dissimilar machines, the 3rd machine in the cell takes twice as long to cycle as the other machines. No products will leave this cell until they have gone through the slowest process or “bottleneck” (machine #3). This is the “bottleneck” operation in this cell. Helping the person(s) before or after another person in a manufacturing cell or system. Example: Let’s say my operation is a little faster than that of the person before me who supplies me with work. I can in some cases finish part of their process so that I will continue to have parts to work on. If too much Bump-Back work is happening it may be that you should re-evaluate the tasks undertaken at each work station in the cell. The maximum achievable results that can be attained in a manufacturing system based on limitations imposed. Size, weight, complexity of parts, environmental regulations, and processes (to name a few) all figure in to determining the capability of a manufacturing system. Note: Some definitions propose an opposing notion that capability is merely what is possible based on limitations. We prefer the more positive definition sited above. The maximum amount a process, machine, or system can produce. Comments: If a machine is running “at capacity” it is going as fast as it can go and producing as much as it can produce. If a machine is running “below capacity” it is able to do more than it is currently doing. It is sometimes not necessary or desirable to run machines “at capacity.” Most cars will exceed 100 miles per hour but that excess capacity is typically not needed or advisable. A problem-solving tool that graphically illustrates the relationship(s) between various process elements which prepares problem solvers to assess the impact of variation from standard. Example: If “widget” production is charted on 3 similar machines and two machines produce equal amounts of “widgets” per hour while one machine produces 20% fewer parts per hour (as per drawn or charted data) then a variable exists that is “causing” the poorer performance of the third machine. Since the best “widget” producing machines run on electricity and regulated air pressure these variables could be having a negative impact on production. Diagramming each element will show (perhaps) that machine #3 was running at 80 p.s.i. instead of 120 p.s.i. like the other two machines. (a.k.a. 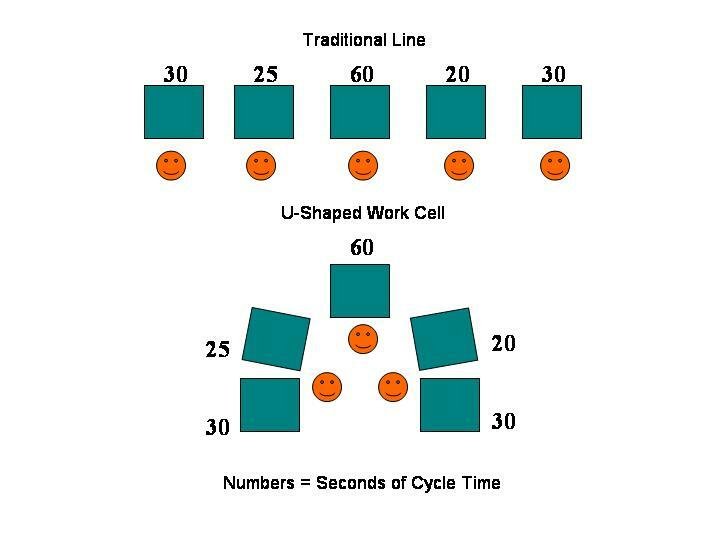 U-Shaped Cells, Work Cells) Generally a horseshoe or U-Shaped work area layout that enables workers to easily move from one process to another in close proximity and pass parts between workers with little effort. “Cells” typically focus on the production of specific models in “part families” but can be adjusted to many different products as needed. Comments: Work Cells do not need to be in a U-shaped configuration though this is often common due to maximizing product throughput with minimal use of space. We have created Work Cells in many different configurations that resemble letters like T, W, X, V, etc., it is also common to create polygons, circles, rectangles, etc. The ultimate layout of the cell is determined by the needs of the product. The goal in laying out a new Work Cell is to pass a part through every needed process with the minimal amount of wasted motion and distance. On the next level the layout of the Work Cell is determined by the manual and machine cycle times and “Takt Time” in order to determine Cell staffing. Other issues when creating cells include redundancy of equipment, size of equipment needed, cure times, and Cell mobility/flexibility to accommodate multiple products. When Work Cells are laid out most efficiently they can usually produce parts with a staff of 1 person moving from station to station (Load-Load), or fully staffed with a worker at each station. Product demand helps determine staffing. Person(s) who lead a company from the traditional manufacturing practices and philosophies to becoming a Lean organization. Comments: As Lean consultants we are Change Agents but the power to change for the better should be grown and nurtured within each company. Nothing helps a company change and improve like a committed senior management. Switching from producing one part/product to another is generally known as a changeover. Comments: This switching or Changeover process may involve removing and replacing dies from machine beds, removing and replacing unused materials such as changing from corn to wheat in a food hopper, black plastic to white plastic in an injection moulding bin, etc. In Lean Manufacturing terms changeovers are best accomplished through S.M.E.D. “Single Minute Exchange of Die.” Which strives to complete a changeover in under 10 minutes. Physically locating personnel and product lines in a single area thereby enabling rapid and constant communication among the key personal responsible for those products. Comments: Many companies now co-locate sales, customer service, engineering, administrative, production, and other functions in an attempt to create a fairly independent and full-service department that focuses on a single product or product family. There are pros and cons to this approach as many redundant roles are common. The up-side is that there is an expertise and almost “omniscient” awareness of customer needs, and production status. The reorganization of product design, development, production planning and procurement processes to take place to the extent possible in parallel (more or less at the same time), utilizing multi-disciplinary project teams, electronic information management, and improved communications. Input is gathered and assimilated from all concerned parties, including manufacturing, sales, procurement, customers, and etc. from project conception throughout development. Comments: No manufacturing plant is better off engineering products in a vacuum. This approach challenges earlier out-dated thinking that the engineers will hand-over new products when they have designed them. With concurrent Engineering all (most in reality), of the stakeholders have a say in the design of products. We have often encountered products that were so difficult to manufacture because engineers were unaware of certain machine idiosyncrasies or limitations, or human effort required to manufacture the products. Taken from (TOC) “Theory of Constraints” A constraint is anything that limits a system from achieving higher performance relative to its’ goal. Comments: In practical application a “Company’s Constraint” is the biggest limiting factor that reduces the amount of throughput the company can achieve. This may mean a machine or process that is the slowest operation (bar none). A company can have many bottlenecks, but in order to be the Constraint of the company it must be the “Alpha Bottleneck” that effects the throughput of the company as a whole. Some companies have more than one Constraint. Although one may be slightly larger than another, working to “break” 2 or 3 constraints of approximately the same size or limiting nature simultaneously is of worthwhile pursuit. The ongoing process/philosophy of doing things better, faster, and cheaper. Comments: A Lean Manufacturing system or organization will usually effect many large-scale and far-reaching changes while implementing Lean as a company directive. After the big “bang for the buck” Lean tools have been implemented there can be a tendency toward complacency. A structured Continuous Improvement process enables an organization to refine and enhance the benefits they now enjoy as a Lean company through usually small and incremental changes within the system. Example: Stamping press #8 typically produces 27 parts per minute (ppm) but “Takt Time” tells us we now need 30 ppm. The press is already running “at capacity” so a decision must be made to purchase a similar press or somehow get 3 more ppm out of press #8. Using a Continuous Improvement process a Kaizen Team would carefully examine the possibility of getting more production out of the machine before buying another one. Perhaps replacing worn belts, hydraulic pumps, regulators, shortening the “stroke” of the machine, or any number of other fixes would improve the machine enough to avoid buying a new one to meet current demand. Moving products through a production system without separating them into lots. Comments: Basically, once you begin producing a product you keep it moving through the value stream without placing it into a holding area for later processing. This helps avoid “batching” and increasing inventory levels. In the ideal production system we attempt to achieve “1-piece flow” in which each product is passed or moved along in the production process independently until it is completed and ready to be shipped to a waiting customer. There may be 100 pieces in a shipping container, but each piece was processed individually throughout the value stream. If a product needs a process like anodizing for example, it may flow continuously until a certain point at which time this process must take place and then be “batched” for anodizing (perhaps mixed with other products). It can later be individually processed until its’s completion. This would not be purely a “continuous flow” process but practical reality. Methods that combine defining of problems, identification of patterns, generation of new ideas, and action planning to resolve problems with unique and innovative solutions. Example: One “Brainstorming” exercise we use to “open” closed minds is to ask a Kaizen team to list ways they might retrieve a basketball from a rooftop. Upon completion of this exercise we generally have a list of more than 100 very original ways to remove the ball from the roof. Although many of the methods would be extreme and not practical to employ, they serve as spring-boards to other ideas that may be highly creative and useful. Getting ball off roof: Ladder, rake, helicopter, bb gun, slingshot, dynamite, trained pigeon, monkey, etc. This is a fun exercise that really helps people change the way they look at problem solving. Taken from Value Stream Mapping, (VSM) the “Current State Map” shows the value stream or process map as it is operating right now. Comments: Very often the “Current State Map” will illustrate significant differences between how things are in reality and the documented processes and procedures. The “Current State Map” is used as a springboard for creating an “Ideal State Map” which (with significant improvements) removes wasteful practices from the value stream. 1) Manual Cycle Time: The time loading, unloading, flipping/turning parts, adding components to parts while still in the same machine/process etc. 2) Machine Cycle Time: The processing time of the machine working on a part. 3) Auto Cycle Time: The time a machine runs un-aided (automatically) without manual intervention. 4) Overall Cycle Time: The complete time it takes to produce a single unit. This term is generally used when speaking of a single machine or process. 5) Total Cycle Time: This includes all machines, processes, and classes of cycle time through which a product must pass to become a finished product. This is not Lead Time, but it does help in determining it. (a.k.a. Demand Forecasting) Prediction of the levels of weekly or monthly product activity over a specified time (generally about two years). Comments: MRP II systems seem to be at least in part responsible for encouraging this practice. A tool for deciding upon and producing the optimal quantities of products needed from each plant to supply distribution warehouses/centers with sufficient products to meet customer demand with minimal costs and risks incurred. Comments: Since multiple plants often collaborate to supply customers with products across a large geographic area a comprehensive distribution management system is very helpful in maintaining minimal product quantities without risking out-of-stock problems that ultimately hurt customers and company. Overstocking warehouses would be one of the “7 Wastes” causing a company to lose money invested in inventory, risk obsolescence, and need larger warehouses, etc. Software that allows updating and refinement of production schedules as demand/conditions change. Giving employees more responsibility, authority, and accountability for effecting the daily processes and improvements within their purview. Comments: “Empowered Teams” or “Self-Directed Work Teams “are an advanced framework for running a work area or department. Many of the best companies invest in the Empowered Teams strategy as a means for creating self-regulating entities that require little supervision and support. Taking the needs of an entire organization into account ERP is essentially an extension of “MRP” “Manufacturing Resources Planning” which attempts to ascertain needs and abilities of a company system. Comments: Both ERP and MRP systems have been getting a lot of attention over the last several years and can have particular value when it comes to very large organizations with thousands of sku’s. Very often we find many “work-around’s” to these systems which greatly compromises their usefulness and data. As software and understanding of systems improves these tools should become more useful. (a.k.a. Poka-Yoke (Japanese) Lean tool for making products correctly the first time. Comments: When thoroughly implemented Error & Mistake-Proofing create improvements on many different levels. Even the products themselves may be redesigned to minimize errors in their manufacture. Tooling and processes are often reworked to produce error-free parts or at minimum catch errors before they become significant defects that require rework or become scrap. Example: One common and popular example of Mistake-Proofing is the design of the VHS video tape player. A videotape will only fully enter a VCR and play if it is placed correctly into opening. Steps and procedures that can be performed while a machine is still operating that facilitate the SMED “Single Minute Exchange of Die” process. Comments: The most powerful technique used in many SMED applications is converting all “Internal Setup” (procedures that can only be completed while a machine is not operating) to “External Setup” procedures. Typically this one step will reduce setup/changeover times by + or – 50%! A systematic/structured approach for determining the seriousness of potential failures and for identifying the sources of each potential failure. The goal of FMEA is to identify potential failures and implement corrective actions to prevent failures from occurring. “PFMEA” focuses on identifying and remediating process failures. Comments: Essentially all parts and or processes will eventually fail (at least occasionally). The FMEA process will help you minimize how serious and common failures are and the impact they have. Attention to FMEA during development phases of products or processes can pay huge dividends. Using FMEA tools after products or processes have been developed is probably more common than employing them during development in general. Generally we find FMEA efforts employed to “fix” critical issues with a part or process problem after it has become very serious. It tends to be a “reactive” rather than “proactive” endeavor in most companies we have experience with. A system for keeping track of the order in which information or materials are to be processed. The goal of FIFO is to prevent earlier orders from being delayed in favor of newer orders which would result in increased lead time and unhappy customers regarding the earlier orders. Note: FIFO can usually be implemented in a very straightforward fashion and makes a good deal of sense on an intuitive and practical level. Where FIFO falls short is the shortcomings and emotional decisions made by humans to circumvent the system. Customers that are considered more “important” than others test the will and commitment of even the most stalwart FIFO advocates. A problem-solving tool that uses a graphic description of the various process elements to analyze potential sources of variation, or problems. The Diagram itself resembles (somewhat) the skeleton of a fish. Comments: Fishbone Diagrams help people begin to visualize the relationships between the various aspects of simple or complex problems. They are particularly helpful to people who prefer to solve problems using visual and written information. Even newly formed teams can use Fishbone Diagrams to help resolve unfamiliar problems. Highly mechanized (often robotic) method for switching from one product type or style to another product type or style. Key in FA is automatic changeovers of dies, materials such as adhesives, and usually small components. Comments: These systems can be especially useful when working with very small parts that are produced in very high volume and are difficult for human hands and tools to manipulate. A manufacturing process/system designed so that production areas (such as work cells or lines) can be changed and rebalanced often to adjust labor and materials to better meet and match demand. Example: In a manufacturing cell we used reversible supply racks and alternate hanging tools that could be immediately employed when the cell would covert from one product line (Brand) to another. A visual depiction of the steps in a process or system. Comments: Simple Flow Charts help in illustrating every step in a process in a concrete way so they can then be analyzed for improvement opportunities and division of labor etc. Comments: In the most practical sense Lean attempts to make everything in a factory “GEMBA” or a value adding process or location. The antonym of GEMBA is MUDA or “Waste” which Lean practitioners do all in their power to eliminate. Measurable statement of specific intent bounded by a specific period of time. Specific: We will change by “x” amount. Measurable: We are now at “x” amount and will Be at “x” amount after improvements. Attainable: These are reachable results even though they may require some “stretch” to achieve. Relevant: The desired results are pertinent to the people and area working on them well within their range of things they are allowed to change. Timely: Specific dates are important. We will change “x” by 9/22/2205. Example: The Metal Fab dept. will reduce scrap on the 600 ton press by 10% from 100 pieces per day to 90 pieces per day by 8/01/05. (A.k.a. Part Families) Group Technology separates parts into “Families” or groups that have similar needs with respect to manufacturing processes. Parts may be “grouped” by size weight, color, flavor, chemistry, treatments/special processing needed, etc. Comments: Creating “Part Families” or “Groups” can result in lower inventories, reduced consumption of process resources, and many other benefits. On an intuitive level and for the purpose of identifying and exposing your “Value Stream” grouping parts into “families” can help to identify further improvement opportunities. (a.k.a. “Future State” or “Should Be” Map) A future-looking version of a process map (VSM) “Value Stream Mapping” depicting how a process will work after improvements are implemented. Comments: Creating a Future State Map is a great exercise for helping your improvement teams catch the vision of where you are going in your Lean process. This map can be created to some degree immediately following the creation of your “Current State Map” or after significant improvements have been made. We recommend creating an Ideal State Map very early in your VSM process to help set the focus for your improvement efforts. Creating something new i.e., an idea, device or processing method; Invention. Comments: Identified by ThroughPut Solutions as the “8th Waste” in “Ohno’s 7 Wastes of Manufacturing,” we recognize that the potential for innovation available in every workforce is largely not realized. We further assert that “Un-tapped Human Potential” to include innovation and inventiveness in all their forms, represents the single greatest losses or “wastes” experienced in manufacturing today. In a manufacturing environment “Internal Customers” are the people, machines, or processes being supplied with the products or parts made in preceding work area(s). Comments: Although both areas (the supplying and receiving areas) work for the same company, it is a good practice for everyone and every department to treat those they supply to as if they were prized customers. This attention to curtesy, delivery performance, and special needs within the Internal Customer area will yield a positive interaction, improve communications, and increase throughput. Very often we find Internal Supplier areas not communicating with Internal Customers areas or perhaps, even worse competing with each other. Building the “Customer/Supplier” relationship is part of changing to a “Lean Culture” as an organization. Comments: The goal of SMED is to change dies or other components/processes in under 10 minutes. “Internal” setup elements that require machines to be completely inoperable are one of the greatest sources of waste during a setup/changeover process. Therefore, much time and attention is dedicated to discovering how machines can continue running during most or all of the changeover process. If a SMED Kaizen Team can make “Internal” setup procedures “External” they will generally reduce setup/changeover times by at least 50%. Are the people, machines, or processes delivering or supplying products or parts they have made to the next (in sequence) work area(s). Comments: Internal Suppliers have an opportunity to satisfy an “Internal Customer” by delivering quality products, on time, every time, where their Internal Customers want them, how they want them, etc. This is a critical issue to effecting a Lean Manufacturing Culture Change. The money and materials invested in by a company in order to create products for sale. Comments: In truth there are few areas that can yield more outstanding initial cost savings than the reduction of inventory in many, if not most companies. Inventory must be viewed as “MONEY” and treated accordingly. Raw Materials: Un processed components waiting for work to be done on them. This is the least expensive form of inventory especially if suppliers will wait for payment until you begin using these materials. Work In Process (W.I.P. ): Materials that have had some work done to them but are not yet finished. This is the second most expensive form of inventory as “value” has been added to the materials. Finished Goods: This is the most expensive type of inventory as the materials have already traveled through the value stream and are now complete. Although most companies carry some Finished Goods Inventory it can be a serious waste and burden on cash-flow. Note: Some consider staff members to be a form of inventory as well as machines, buildings, electricity, innovation, and etc. The number of times you can “Turn” (use and replace) your inventory/money over in a year. The “real world” is not as “clean” as the example above, and it can be challenging to “know” how many times each year you “turn” your inventory. The real message behind Inventory Turns is to keep enough inventory on-hand to satisfy your customers but not so much that it winds up collecting dust and costing you money in the form of lost interest, damage, obsolescence, storage space, moving it around, etc. A Lean Manufacturing process for synchronizing materials, operators, and equipment such that all materials and people are where they need to be, when they need to be there, and in the state they need to be there in. Comments: JIT is ultimately focused on reducing or eliminating every form of waste in the manufacturing process. Many Lean Manufacturing tools help to make achieving a Just-in-Time system possible. Example: It doesn’t matter much if materials arrive at a machine for processing when the machine is “down” due to poor maintenance. A TPM “Total Productive Maintenance” program could remedy this situation. Likewise, if it takes several hours to change-out dies materials could spend substantially more time waiting for processing than actually being processed. SMED efforts are warranted to enable quick changeovers and allow JIT methods to be effectively employed. (a.k.a. “Kaizen Team(s)” “Improvement Team(s)”) Team(s) that implement the Lean Manufacturing tools needed to effect improvements. Comments: Many companies use a single “Kaizen Team” to effect the changes brought about by Lean Manufacturing. We do not recommend this approach as it limits the input and engagement of the workforce in general. We recommend multiple Kaizen Teams engaging in the improvement process through the implementation and refinement of Lean Manufacturing tools and undertakings. It becomes the “2 heads are better than one” approach and motivates employees plant-wide to become involved in the evolution and improvement of the company. Comments: So what is KanBan signaling? KanBan “signals” are basically just telling workers that there is more work to be done. In other words, the presence of a “KanBan Card” or an empty “KanBan Location” is a “signal” to do the work described on the card (make the parts) or fill the empty KanBan location with parts which means you have to make them to put them there. There are many ways to use and implement KanBans like empty totes, pallets, cartons, flashing lights, electronic messages, etc. You can even park a semi truck at a certain dock and that could be your signal to produce parts that will be shipped via this truck. There is no limit to the creativity you can have with KanBan signals. One key is to make them work in your specific situation and environment. Perhaps the most important rule of KanBan is to “Obey KanBan.” In other words do not go around the system or it will fail. Failing to keep the rules of KanBan will result in higher inventories, greater risk for errors/defects, and other associated problems. Now that we have emphasized keeping the rules of KanBan we must discuss a few reasonable exceptions. Breaking KanBan limits to production should occur if a machine has broken but will be able to catch up as soon as it is repaired. Yes, you will be building inventories, but this machines cycles faster than the feeding machine(s) and will be able to process the “TEMPORARY” glut of WIP “Work in Process” parts. One more exception might be breaking KanBan to create parts for a customer or sister company that suddenly and desperately needs parts that are only finished to a certain degree. You may find yourself off-loading a machine or process to feed temporary work cells to meet this unexpected and “temporary” demand. Generally speaking you’ll want to stick with KanBan and follow its’ basic rules. It works better that way. Click HERE to Watch a Brief Video Tutorial on 2-Bins Systems. Software that uses artificial intelligence methods/systems and an information base regarding a specialized activity to control systems or operations. The opposite of “F.I.F.O.” (First In First Out). With LIFO earlier orders are delayed in favor of newer orders which results in increased lead-time and unhappy customers regarding the earlier orders. Comments: Both LIFO and FIFO can also be a reference to the order in which stock is consumed. Generally speaking companies should use their oldest stock before using the newest stock. This becomes very important with perishable goods and goods with limited shelf-life. As consultants we have seen dust more than 1/4th of an inch thick on stock that should have been consumed in order of purchase years earlier. It is difficult to decide in many cases whether this stock is still good to use, has become obsolete in some way, has some latent defect, and etc. Many advanced material handling systems, stacking systems, and simple KanBan methods can keep your inventory stocked in FIFO order to avoid the many pitfalls of LIFO failings. All that said, there are times when LIFO measures seem essential. If a customer who represents the majority of your sales requests something immediately it is very difficult to tell them they must wait their turn. The time required from receipt of order until products are shipped to a customer. Notes: Sometimes the single biggest difference between competing companies is the amount of Lead-Time they will commit to. If company “A” promises they will have your products delivered to your door in 6 weeks and company “B” promises a 1 week delivery which company will you likely choose? Lean Manufacturing has many tools that ultimately reduce Lead-Time and win market share. Oddly enough Inventory in a manufacturing system has the limiting effect of increasing Lead-Time. Chew on that one for awhile. (a.k.a. Lean Manufacturing) An organization that is engaged in the endless pursuit of waste elimination in all of its’ activities. Comments: Lean Enterprise focuses on all aspects of a company’s system. Whereas Lean Manufacturing tends to focus on production activities, Lean Enterprises are diligently working to reduce waste in all of its many forms in every department and activity the organization engages in. Lean Enterprises reduce or eliminate paperwork, improve supply chain agreements, enhance hiring and training processes, provide employee development opportunities, and many other such activities. Lean Manufacturing is now present throughout the world and has become a global standard or set of practices which virtually all companies must adopt in order to be competitive in a global economy. Beyond the “need” to compete globally Lean empowers and motivates employees to engage in the betterment of their respective companies. It’s also good fun! (a.k.a. Heijunka, Balancing) A Technique used to balance production throughput according to the needs of customers (Demand). Comments: Level-Loading is loading your production system according to the exact needs (+ or -) of your customers. Ideally it is based on the consumption of products customers are “pulling” from your system. Mixed-Level-Loading supports the same concept as Level-Loading which is to supply your customers with exactly what they need when they need it. However, “mixing” includes producing perhaps many different models of products in correct quantities and ratios to satisfy customer demand for a variety of products with shorter than average lead-times. Level and Mixed-Level Loading are advanced Lean methods and require a good deal of Lean implementation before they can be very successfully applied in “real world” plants. You must have the ability to switch from one product to another very quickly (usually automatically) to make this system work. Often you will need to modify tooling to accept a variety of parts so that no changeover process is required at all. You get the point! Finding the right “mix” to satisfy each customer “real-time” is much easier than being able to produce that mix. Putting all the best Lean tools in place will enable you to eventually take your production to this pinnacle level of performance. Note: SME also has a good article and graphic about the “Heijunka Box” tool that you might find useful. The extent to which a product can be efficiently manufactured with maximum reliability. Comments: Many products are very difficult to produce and are very often not designed to be mass produced. Sadly, only after a good number of failures and a host of frustrated employees have complained do many product designers finally consider easier, faster, and more reliable ways of manufacturing parts. We urge product designers to work closely with engineering, production, tooling, and even operators when developing products that must later be produced in the thousands or millions. A coordinated effort can make an enormous difference to ultimate successful production. The practice of planning, designing, and managing people and machinery to produce useable products. A networked computing system used to automate production control and process automation through intercommunication between production scheduling, work scheduling and production throughput to bridge gaps that might appear between these functions. A computerized method for planning the use of a company’s resources, such as scheduling raw materials, suppliers/vendors, production equipment and processes. Comments: Many MRPII systems include distribution management, certain Human Resources Functions, various customizable business critical functions, and toll-gating features etc. To be blunt as Lean practitioners we tend to employ “Occam’s Razor” which paraphrased states that the simplest answer is usually the best. There is a great deal of complexity in these systems and many times their output is ignored or worked-around. Look for improved planning software that takes Lean principles into account in the near future. Many good people a fair amount brighter than the rest of us are working hard to create truly incredible new systems. The process for assuring that products have been produced and function as designed. Comments: Depending on many different variables certain specifications and measurements are taken to “guarantee” manufactured products work as they are designed. Many companies spend exhaustive amounts of time checking and rechecking their work and documenting ad-infinitum. This is especially true in companies where potentially dangerous or “high-risk” products are made. Companies making Nuclear Reactor components must test, verify, and document even the very smallest details to satisfy themselves that their parts will work as designed and equally importantly satisfy the government that they have proven out their process and products with approved procedures to specifications. Like any “good thing” we have seen test and verify processes significantly impact companies in very negative ways. Some companies have engaged in testing processes that unnecessarily consumed days of what could have been production time and many hours of labor while they consistently yield no measurable gains resulting from all of the extra effort. Leaner and simpler are almost always better. A production system that stresses the production of relatively small lots of customized or somewhat unique goods. Comments: In manufacturing terms it is generally more profitable to produce large quantities of a single standardized product than to make small quantities of many different products. With Mass Customization however, a good many standardized techniques are used to streamline what is otherwise a difficult market to succeed in. Mass Customization rationale might be something like; we have the equipment and personnel to anodize, machine, paint, and sand blast products so we can create alternate brand name and somewhat unique products using these processes with a somewhat standard approach. Example: Consumers can now purchase a pair of “custom-fit” jeans on-line to suit their particular desires. On the manufacturing side, denim has been produced in many colors and styles and often has been cut into “blanks.” Depending on the size requirements a “blank” in the range of desired specifications would then be sewn to create the custom-fit jeans. Look for more customization in every consumer product over time and expect lead-times to become shorter and shorter as suppliers compete for your money. Large-scale, generally very standardized manufacturing practice with high-volume production and output. Comments: Those companies engaged in “Mass Production” today are in serious trouble if they do not implement Lean Manufacturing techniques. Not long ago warehouses full of inventory were considered assets. Today we recognize the waste inherent in carrying large inventories. Example: To use an extreme example, if your company produces three types of automobiles “A”, “B”, and “C” and you want to “Mass Produce” for maximum efficiency then you might schedule your plant to build type “A” cars during the first 4 months of the year, type “B” cars during the second 4 months, and type “C” cars during the final 4 months of the year. This would limit costly changeovers and downtime from switching models so often. The problem is self-evident as the Lead-Time for any particular car is 1 – 4 months if it is “in season” and up to 12 months if the season just barely ended for the type of car you want to purchase. Flexible Lean plants can make all three types of cars anytime and during any season. Overall sequenced schedule of multiple orders through a factory. Comments: Some poor bloke may be known as the “Master Scheduler” or in many cases a software package now generates a Master Schedule. (which everyone sort of pays attention to until it is no longer convenient or there is a “hot” order that needs prioritizing. The function of moving objects from one location to another. Comments: In a Lean environment Materials Handling becomes a bit of a science rather than an aside to manufacturing. Lean systems require fairly exacting quantities of correct materials to feed processes very quickly and then require changing again to different materials and quantities usually on-the-fly. When done well efficient material handling supplies work areas just before they need the new supplies to continue to operate or changeover to new products. Of course Materials Handling also must deal with more routine palletizing and storing finished goods for shipping as well as loading trucks, operating cranes, forklifts, etc. A great crew can significantly reduce losses due to damage caused by moving items around. We have tapped into the skills of Materials Handling personnel many times to streamline warehouses and put raw materials at “Point of Use” locations for easy access. Using software, materials planning is accomplished through evaluating the Bill of Materials (BOM), Inventory Data, and the Master Schedule in order to stimulate replenishment of materials to be consumed and present purchase orders (Po’s) for future materials needed. Groups formed from people with varying skill-sets typically across departments to achieve a business goal. Comments: Groups become “Teams” when they behave like teams. Using Multi functional Teams can be of great benefit to most companies especially when they work with complex issues that require expertise from numerous backgrounds. With many of our Kaizen events we will create a “Kaizen Team” that includes operators form the area we are working on, staff from “feeding” and “supplying” areas, a supervisor, a maintenance tech, perhaps a secretary, and maybe even a janitor. Although Multi functional Teams generally refers to specific expertise and skill-sets, one should never overlook the benefits of having many pairs of “fresh eyes” on a problem solving team. Any process or event that does not make a product more like what a customer is willing to pay for. No customers want to pay for activities that do not “add value” to their products. The fact is all customers indirectly pay for Non-Value-Adding activities because suppliers build them into the sales price of everything they produce. Example: Customers want “widgets” delivered to them. A supplier company makes great widgets, but has to move them to shipping (NVA), put them in boxes (NVA), and ship them (NVA). These activities were essential, but none of them made the widgets anymore valuable to the customer. A broad term suggesting administrative responsibilities and duties related to office functions, manufacturing, procurement, distribution, various management issues, and global accountability. Comments: If a person is an “Operations Manager” they will normally take on many of the responsibilities in the above definition. They may also be directly accountable for profit and loss realizations and directing the global activities of a corporation. Operations can also be a term to describe the day to day activities a Plant Manager must engage in to keep the plant running. Often you will see titles like: Director of Operations, Director of Manufacturing Operations, or “COO” Chief Operations Officer. Each of these titles implies significant accountability and leadership even though specific areas of accountability will differ. It is also common to refer to various processes as “Operations.” Some examples include the anodizing operation, the welding operation, the plating operation, etc. Machine Availability: Is The Actual Time Left For Production After You Subtract All Planned Downtime. Quality Rate: Tells Us How Many Good Parts VS. Defective Parts A Machine Has Produced During The Time It Was Running. OEE is an essential measurement for determining the effectiveness of your equipment and beginning to understand where up-time improvements are possible. Colored lines or shapes painted or taped on a floor that provide Visual Cues/Information. Comments: Variations of this technique are used to provide a very quick reference or assessment regarding stock levels that would not require physically counting the stock. Example: Many companies that use this tool might tape or paint a floor or wall with three basic colors to indicate the “status” of out-of-stock or in-stock items. 5S Visual Workplace uses a version of this tool to paint or tape walkways, locations for things such as pallets, danger zones, electrical boxes, carts, totes, etc. A graphical tool for ranking causes of problems from most significant to least significant. It is based on the Pareto principle, first defined by Juran, 1950. Pareto Charts suggest most effects (or results), come from relatively few causes; that is, 80% of effects come from 20% of the possible causes. Comments: Almost all companies use Pareto Charts to gain a better sense of or appreciation for data collected. As consultants we have literally seen thousands of Pareto Charts and they all kind of start to blend together after awhile. Pareto Charts are great to use, but use them in moderation. Very often we will see entire walls dedicated to Pareto Charts that are largely or entirely ignored. Perhaps too much of a good thing. A results driven, formula based, set of activities that produces an outcome. Alternate Definition: A series of activities that collectively accomplish a distinct objective. Comments: In Lean Manufacturing terms a process is a recipe for how something is done. Processes are also closely scrutinized for improvement opportunities. Example: Even making a peanut butter and jelly sandwich involves passing through a process. If all of the ingredients for your sandwich are located in your kitchen accept your jelly which is located in the Garage, then you would clearly have a process improvement opportunity. A work flow diagram which depicts the elements of a work flow often using time, people, and machine information to illustrate tasks and results. Comments: Process maps can be used as a starting point for beginning a Value Stream Mapping exercise to find “Value-Adding” steps in a process. A discipline that uses a set of tools to analyze a company’s practices and evaluate them as compared to “Best-In-Class” companies for the purpose of improving those practices. Comments: The lines between Process Re-engineering, 6 Sigma, and Lean often become a bit fuzzy. Certainly each discipline contributes to the available tools and knowledge accessible from any of these three frameworks or approaches. The scaled amount of benefit realized as derived from inputs. There is an old joke about a farmer selling watermelons who figured out he was losing about 8 or 10 cents per melon when it came time to sell them. He decided he would have to make it up on volume. If you don’t understand the joke we are in real trouble here! Doing the “right” things productively is always good. Building inventory to be “productive” when there are no sales or you are losing money on the products is always bad. Sometimes we see productivity numbers that brag about success while profit margins show the opposite. We realize uses of this term vary somewhat. A quality system/standard, based on ISO 9000, used by the American Automobile Manufacturers to register their suppliers. Comments: Many quality systems now exist to regulate quality standards throughout the world. It is important, even essential for many companies to endorse and qualify for registration into a quality system specific to their industry if they are to be competitive especially in world markets. Far too often we are aware of companies who fail to realize the full benefits of participating in a structured quality system even though they are registered or certified within one. Rather, many companies only become certified to some extent “in name only” so they can attract new customers or retain current customers who have imposed a quality system certification requirement on them. A systematic and usually independent examination of a companies commitment to quality practices to verify if quality related activities are implemented effectively and comply with the company’s or industries quality systems and/or quality standards. Comments: Both “Internal” (conducted by in-house auditors) and “External” (conducted by outside/independent auditors) quality audits are common in most globally operating companies. The process used to design quality into products, service, or processes during the product development phase. Comments: It is always better to “start with quality” rather than to try and “build quality in.” Sure it is a bit cliché, but many companies spend most of their existence trying to make-up for poor design. A process that avoids creating conventional tooling thereby limiting investment expense while new parts or products are tested for feasibility of manufacture. Comments: This is a very exciting area for improvements in manufacturing generally. Some Rapid Prototyping software and devices are maturing to the point where it is starting to become possible in the near future that we will be telling computers to “make a basketball” or “make a fuel injection system.” Pardon the reference to Star Trek, but some of the equipment we have seen begins to resemble the “Replicator” technology that sits on most countertops (much like a microwave), in the crew quarters on the Starship Enterprise. Don’t be surprised if Rapid Prototyping quickly evolves into Rapid Creation. The face of many industries will be changing significantly as this technology develops. The redefinition and improving of a company’s internal processes based on “Best Practice” standards. Repeating work activities using the same processes every time. Comments: Standardized Work will generally include testing work processes again and again to prove out the “Current best ways” of completing tasks. The “current best ways” is an important concept as one of the basic tenants of Standardized Work is that you are always looking for better ways to do work. Normally when we help companies implement Standardized Work we use photos, simple diagrams, and plain text to make work instructions and present them in a very clear manner. Special Note: If ever the need for stopwatches is warranted please let your operators do the timing. Few things displease and disrespect operators more than a manager or supervisor hanging over their shoulder with a stopwatch timing their every move. Trust us on this one. A procedure that applies the laws of probability and statistical processes to observed characteristics of a product or process. The tool used to pass data and expectations between suppliers and customers with the primary purpose for the customers being to have what is needed, in the quantity and quality needed, and at the lowest possible price. Comments: Managing Supply Chains has become an area of specialization in which entire careers are now built. Expectations on suppliers to lower prices, ship on-demand or forecast with increasing perfection are common. Many customers expect suppliers to replenish the stock in-house requiring visits from supplying companies on a regular basis. As an increasing trend customers are requiring suppliers to delay billing for materials supplied until those materials have been consumed in-house or in some cases until outside customers have purchased finished goods that contain the materials from the original supplier. Can anyone say “Cash-Flow”? Stricter requirements are pushing suppliers to limits in many cases essentially weeding-out smaller companies from the supplying base. A process whereby all elements of a product are incorporated and usually tested in order to insure proper functions per customer specifications. Comments: This can also include installing customized components on-site in customer companies to guarantee proper “matching” and usability of the manufactured product or device. Matching the rate of production to the rate of sales or consumption. Comments: Takt Time (a German word for meter or measure) is often compared to a metronome symbolizing “keeping time.” in its purest sense Takt Time is used to only produce exactly what your customers will consume; nothing more and nothing less. In practical application knowing what Takt Time is for a specific product can help you understand the level of effort you will have to exert to meet your customer’s demand. Using an “easy math” example: If your customer wishes to buy 10 products from you every day and your normal production shift is 10 hours, then your Takt Time is 1 part per hour. Producing only 9 parts per day would create a shortfall and leave your customer wanting. Producing 11 parts per day would create excess inventory and all the inherent problems that come with excess inventory. Comments: We love working with Teams, especially if they are “Empowered Teams.” Two heads are definitely better than one and Teams will almost always come up with better answers and improvements than a single person can on their own. Look for Teams to almost completely replace standard heirarcal supervisory structures and systems in the future. This seems to be the natural evolution of self-direction in manufacturing today and going forward. The representative of the team for which they are a member of. Comments: A “Team Lead” may have some supervisory responsibilities, but largely is “just one of the team” meaning they roll their sleeves up and work just like everyone else. Generally we encourage companies using Team Systems to allow team members to “elect” their own Leads and encourage them to rotate who fills the Lead role (as well as other roles), on a periodic basis. Team Leads can be seen as the liaison between supervision, management, other departments, etc. This structure tends to streamline communications as the Lead disseminates needed information to the rest of the team. The rate at which work proceeds through a manufacturing system. Comments: Generally speaking the greatest inhibitor to Throughput is waste. Machine downtime, waiting for materials, out of stock supplies, operator errors, poorly designed processes, etc. all contribute to poor throughput in a manufacturing system. All Lean improvements ultimately result in increased throughput of company products. In the “ideal” Lean environment materials are brought directly to the first processing area, processed as needed throughout the system, and loaded onto trucks or rail cars etc. Increasing Throughput is always a function of eliminating waste found throughout the system. Even small improvements that eliminate or reduce waste can have a cumulative effect on overall throughput. (a.k.a. Prime Contractor, Prime) A supplier with prime or paramount design responsibilities for key systems, subsystems, or components as pertaining to end product(s). (a.k.a. Sub-Contractor, Sub) A supplier to Tier 1 Suppliers, or a direct supplier of less critical components, systems or subsystems. A bi-product of this “race to market” is that competing companies must adapt their organizations in ways to minimize the time it takes to develop a product to exploit the “First on the scene” advantage. The length of time it takes to develop a new product from inception until its’ first market sales. Comments: Products are being developed so quickly that companies must strike a balance between being “first on the scene” with new products and giving away under-developed ideas that competitors may improve on with lightning speed. Consider what has happened with MP3 players in the last few years. Speed and “features” have been competing in this market and there seems to be no end in sight. A Quality Control System focused on the correction of quality issues before they are permitted to subsequently be passed on for further processing. TQM systems are often “built-in” to manufacturing processes. Comments: TQM has significantly raised the awareness for the need to address quality concerns early in processing so as to limit losses of high-value parts or products. TPM is an equipment maintenance system that proactively addresses maintenance issues before they become major problems and cause equipment downtime. Comments: TPM engages machine operators and staff in the routine maintenance of equipment so machines are constantly maintained on a basic level. More advanced maintenance procedures are still performed by skilled maintenance professionals. TPM efforts include putting machines on a schedule so that all of their maintenance needs are addressed on a regular basis without overlooking essential steps and processes. A good TPM program will free-up maintenance workers so they can address urgent and critical repairs that result in immediate downtime. Maintenance staff will also have additional time to allot to more proactive and preventative maintenance overall. Operators and production staff generally wait less for maintenance dept. assistance and learn some new ways they can resolve minor machine issues without need for further maintenance support. Truly, everyone wins when a TPM program is functioning as it should. TPM is great fun to implement and virtually always results in a dramatic reduction of wastes due to downtime immediately and in the long-run. New – Free Online Video Explaining OEE (Overall Equipment Effectiveness) & OEE Calculator *There’s a download link for this tool at the end of the video. The “real attainable volume” at full utilization of a manufacturing system or subsystems after deducting for “normal events” such as machine maintenance, known bottlenecks, etc. Comments: This is a fairly fluid concept and will change by degree for various reasons. In other words, it is more of a construct to help you have a “sense” of your real capacity, but is not any sort of exact measurement. Comments: Lean Manufacturing is about eliminating waste which is “Non-Value-Adding” (NVA), in order to strictly and consistently focus on Value-Adding activities which customers are more than happy to pay for. Any difference(s) that exist between design specifications and actual output. Comments: Manufacturing always experiences variation by degree. In some settings “give or take a few inches” and your product is still well within tolerance and customer specs. In other settings perhaps only a few microns will make the difference between a “good part” and a piece of scrap. Software-based engineering process that includes the use of modeling in multiple dimensions and in software simulated “normal operating conditions” in order to discover weaknesses, design improvement opportunities, and general refinement before physically building a tangible prototype. Comments: Whatever the undertaking it generally pays great dividends to invest time and effort very heavily into the “front-end” of a product rather than try to “work the bugs out” after it has gone to manufacturing. Once again with “Speed to Market” concerns a balance must be struck so as to not lose out to faster competitors. (a.k.a. “MUDA” in Japanese) Any activity which utilizes equipment, materials, parts, space, employee time or other corporate resource beyond the minimum amount required for value-added operations to insure manufacturability. When Work Cells are laid out most efficiently they can usually produce parts with a staff of 1 person moving from station to station (Load-Load) or fully staffed with a worker at each station. Product demand helps determine staffing.